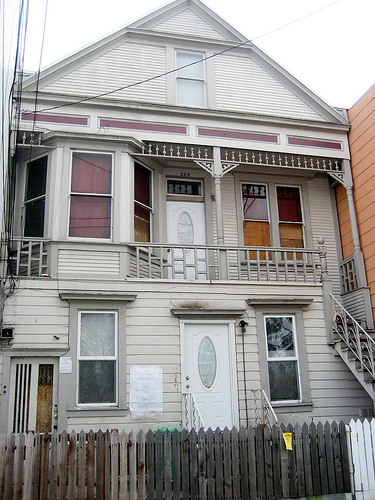 A house at 288 Precita used as a "safe house" by Bill and Emily Harris of the Symbionese Liberation Army (SLA) in 1974 until they were arrested. Charles Bates, head of the FBI'S San Francisco office and the man directing the overall search for Patty, ordered a watch to be kept on both dwellings. On Precita Avenue, four agents sat in a light green Ford LTD parked at the curb, and three more waited in a yellow and white camper just down the block. The agents wore sandals, beards and beads, hoping to blend in with the inhabitants of the area. Still, neighbors spotted the stakeout and watched with considerable interest to find out who was being trailed. No one appears to have suspected the athletic and pleasant young couple who had just moved into an apartment in the neo-Victorian structure at 288 Precita. At 1:15 p.m. last Thursday—a clear, cool day that was perfect for running—the couple from No. 288 came down the stairs and went loping off to nearby Bernal Park. The agents thought they knew who the two were from sightings the day before, but they still were not sure. "Our pictures of them were almost two years old," says an agent. But when the pair came jogging back home, there was no longer any doubt. The four agents leaped out of the LTD, and the other three came sprinting from the nearby camper. They were armed with pistols, a sawed-off shotgun and submachine guns. One watching neighbor later recalled, "They [the agents] seemed very nervous and shaky." The woman tried to get away, only to be caught within 20 ft. But the man calmly put up his hands, says another witness, "like a little kid who had been caught doing something wrong." His attitude seemed to be, she adds, " 'Well, I'm caught.' " Swiftly, the FBI agents handcuffed William and Emily Harris. Then, as city police cars closed off both ends of the block, some agents hurried into the apartment; while others, guns drawn, burst into a few of the neighboring houses to look unsuccessfully for Patty Hearst. In the Harrises' apartment, the FBI found 40 pounds of black explosive powder, three .30-cal., fully automatic carbines, two shotguns, two pistols and a substantial amount of ammunition. Patty Hearst was found less than two hours later at the house on Morse Avenue.